Belgium investment group RHJ has raised its bid for General Motors' (GM) European car firm Opel from 275m euros ($391m, £241m) to 300m euros. RHJ has also lowered the amount it would request in German state aid were it to take control of the company. The offer would see RHJ take a 50.1% stake in the company, with GM retaining 39.9% and employees holding 10%. RHJ's improved offer is the latest development in the long-running battle to buy GM's Opel business. Last month, GM failed to choose between Magna and RHJ's initial bids, leading to speculation that the sale would not happen for fear of technology and engineering resources ending up in a competitor's hands. GM - which emerged from 40 days of bankruptcy protection in July - quickly confirmed that the deal was still under discussion. Control of Opel was handed to a German-led trust when GM entered bankruptcy protection. The trust will have to approve the final outcome. The German government prefers the Magna bid based on the two companies' plans for job cuts at Opel following the takeover. Both will see significant cutbacks in the workforce, but Magna is proposing fewer job cuts in Germany. 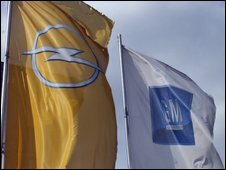 Germany has already given Opel 1.5bn euros in loans to keep the company afloat. With nearly 25,000 people employed at Opel's four plants in Germany, the country has a strong interest in the outcome of the takeover.